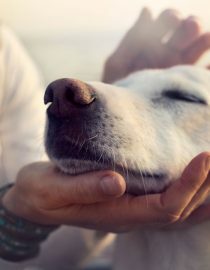 Is Pet Therapy Beneficial for Lupus? The Royal Society for the Prevention of Cruelty to Animals (RSPCA) reports that pet ownership has many benefits, both psychological and physical. For example, those who own pets and engage in pet therapy report having lower blood pressure and cholesterol than those who do not have them. They can also increase fitness by forcing you to take your little guy out for a walk or have an indoor play session, and they can significantly help combat feelings of anxiety and depression. Pets can even increase your self-esteem, self-worth and can help you make friends, as they can start conversations or lead you to events centered around the specific animal. Personally, I have only ever owned a dog that was all mine and totally my responsibility. When I was nine, I begged my mother for a hamster. I named her Claire and she bit people and didn’t like to be held. By the time I was 11, I had grown tired of her, but I was still somewhat attached to her — at least enough that I wasn’t ready to give her away. Still, the attachment I have had to my family dog and now my own personal dog totally surpasses any feelings I had for my hamster. Don’t get me wrong, hamsters do make lovely pets for certain types of people, but my dogs have been the pets I have loved and cherished above all. Goodie, the dog I grew up with, passed away 10 years ago now and I still miss him and recall him fondly. Now I have Eugene, a 7-year-old stubborn as ever shih tzu who has gotten me through the worst of my lupus. I got Eugene when my symptoms were just starting to take a turn for the worse and I was being loaded with more medication. At that time, I had just gone through a break-up, and although I had friends in town, many a night were spent with just Euge and me cuddled up together as I put ice packs on every possible part of my body. Although some people may doubt it or find it a bit weird, having Eugene and engaging in pet therapy has honestly helped me through some of my toughest lupus moments. Over the summer of 2010, I was bedridden for almost a month. Having Eugene, however, gave me the impetus to get up every now and then and keep me from getting blood clots and get some sunshine on my skin. I lived with a roommate at the time, but since he worked full-time and was obviously not employed as my caretaker, I spent a lot of time alone in bed, ordering groceries and toiletries to the apartment and sleeping as much as humanly possible. And despite my feeling absolutely terrible, Eugene still needed to be fed, taken out for bathroom breaks and have his basic hygiene maintained. Though it was exhausting to keep up with, it gave me something else to focus on, even for a few moments, while I was in total lupus hell. Next page: is pet ownership right for you?